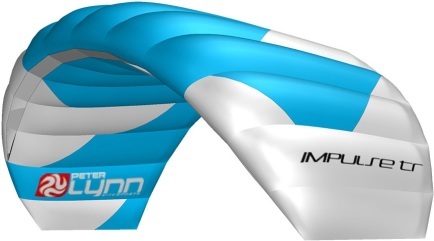 The Impulse TR is the perfect trainer kite for anyone who wants to improve their kite flying skills to get into kiteboarding, landboarding or snowkiting. A unique shape, bombproof construction, 3-line setup and the control bar with safety leash help entry-level kite flyers to develop their kite skills and get used to the power of a kite. The kite has been developed to offer a perfect balance between speed and stability, so riders get challenged when flying the kite but will not struggle to keep the kite in the air. The power can build up to quite a bit, so the rider rapidly learns which sections of the wind window create the most power and which sections the least. 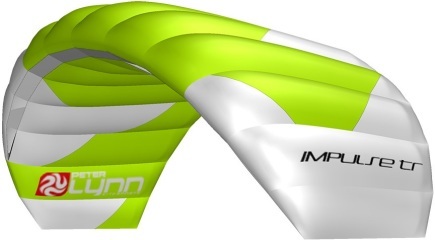 The Impulse TR can even be used to ride a land board or a buggy, to get more experienced with kite traction activities. The Impulse TR is flown on a 3-line control bar with safety system, to get an experience as close as possible to kiteboarding or landboarding right from the start. The extra center line, the Life line, makes a very easy instant relaunch possible. We used in our schools the peter lynn impuls (2 line) as trainer kites on the beach. The 2m and 3 m. Great trainers! Pretty strong so we used them with low winds 2m up to 18knts 3m up to 14knots (depending from weight). We use them now 2 seasons and still usable. We like the stability, ease of use and price/quality. Peter Lynn Impulse TR. compl.